TIME:LINE began as a series of intercontinental and cross country challenges. From his native Holland and then his new home of North Carolina, Nicolay would launch tracks to Kay at his home base of Houston. Nicolay wanted to see how far he could push Kay before he cried uncle and was unable to lay down a verse on the music that Nicolay was sending him. Kay never blinked. With each successive track, Nicolay was changing the feel, tempos, and pushing the boundaries of the hip-hop genre itself. Kay would push back at Nicolay, laying down verses with different cadences, styles, and themes ranging from the abstract to the ultra-personal. The resulting album is one of the most captivating hip-hop concept albums of the last ten years. Over the course of twelve tracks, Nicolay & Kay present their case for what the future of hip-hop sounds like. Nicolay is best known as the producing half of The Foreign Exchange (the other half being Phonte Coleman of Little Brother), whose debut album Connected (BBE Records, 2004) made a huge impact on the underground hip-hop and soul scene. 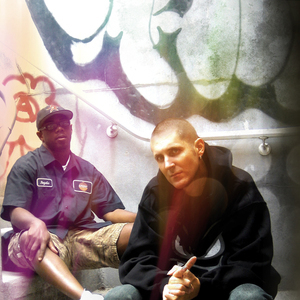 The Foreign Exchange was featured on MTV, VH1, BET and NPR, and Connected quickly reached #1 on CMJ's Hip-Hop chart. Since then, he has produced for Little Brother, Supastition, Masta Ace, Strange Fruit Project and Zion I and remixed tracks for Roy Ayers, Bob James, Candy Dulfer and many others. He has released several albums under his own name, most notably City Lights Volume 1.5 (BBE, 2005) and Here (BBE, 2006). Kay Jackson has been one of Houston's most promising emcees ever since forming his first group Example with longtime best friend DJ Cipher, in 1996. Kay soon began to expand his abilities by making beats and his next project, The Foundation, formed with Mint Condition drummer Chris Daddy Dave showed a remarkable musical growth, leading the way to collaborations with Ali Shaheed Mohammad (Tribe Called Quest), SA-RA Creative Partners, and Bilal. Nicolay and Kay met on the Okayplayer.com message boards in 2004 (the same way Nicolay and Phonte originally hooked up). They started sending music to each other and giving each other advice and encouragement. Nicolay produced the track "My Story" for Kay's album The Talk Show, which was slated to be released on Ali Shaheed Mohammad's imprint, Garden Seeker Productions. As is unfortunately common and always tragic, because of various "complications", the finished album was indefinitely shelved. Kay was dejected; he had been grinding for years and The Talk Show was going to be his ticket to the next level. He confided in Nicolay that he was considering quitting music altogether. Nicolay still believed in Kay's potential, and as encouragement to keep going, he included Kay's song on his 2006 release Here. The response from fans and critics was overwhelming; most felt the track was the defining song of the album. Based on this response, they began brainstorming concepts and sounds that became the basis for TIME:LINE. Nicolay and Kay are the perfect foils for each other's style. Whereas Nicolay is methodical and deliberate, Kay prefers to work on the edge, improvising on the spot. He never writes his lyrics down, preferring instead to work them out in his head and use his own form of shorthand to help him remember. This combination gives the songs in TIME:LINE the tension that makes them enthralling. Nicolay comments, "Kay sent me his verse to 'I've Seen Rivers' and I was blown away because it's apparent that he's going off the top of his head without an obvious plan. He's more like a jazz saxophonist riffing on top of my backbeat and it sounds like he could fall out of time at any point. But then he lands perfectly on beat at the end and you almost have a sigh of relief." While they have different ways of execution, both have a strong sense of musicality that is apparent on TIME:LINE. Born and raised in The Netherlands, Nicolay was brought up with equal parts of Stevie Wonder, Neil Young, and Dmitri Shostakovich and his love of music drove him to seek a formal music education. A true multi-instrumentalist, Nicolay is proficient playing piano and keyboards, guitar, bass, and drums. Kay was also raised on an eclectic blend of influences and is a complete musician in his own right. With an appreciation of jazz and hip-hop featuring live instrumentation, he is the atypical emcee who can also write and arrange music. There is a dual evolution at work in TIME:LINE. Lyrically, it is the loose story of one person's life, taking the listener from birth through the ups and downs of life, to death, and then on to the afterlife. Musically, Nicolay matches Kay's narrative with tracks that evoke different eras over the course of the album. His production provides the soundtrack for the narrator's life. Beginning with a reverb soaked 60's wall of sound ("TIME:LINE"), the album progresses to a 70's funky party vibe ("Blizzard"), a cold and crisp 80's electronic feel ("Tight Eyes"), and finally to Nicolay's signature millennial sound("Dancing With The Stars"). Despite the diverse styles Nicolay references, the overall sound of the album is cohesive, something that Nicolay is especially proud of. He explains, "I had decided fairly early on, that because of the overall concept of TIME:LINE, I wanted to segue all of the tracks into each other seamlessly, so that it would basically be around forty-five minutes of continuous music. This approach required me to come up with key changes, modulations, effects and more to have each transition make sense." With a level of attention to detail Nicolay describes as "psychotic at times," the album could easily have become overwrought and over thought. TIME:LINE is neither. It is the remarkable product of two talented musicians working in harmony while thousands of miles away from each other. In 2007 Nicolay launched his own label, Nicolay Music. TIME:LINE will the label's first full length release.